Spring is springing and I have been busy!! My camera is getting cleaned and fixed after the last six years of heavy labor, so unfortunately I cannot grace you with pictures at this time…. there are some finished belts and some new headbands you’ll just have to check out in person at Head to Toe in Black Mountain! Coming up this week there will be some hot new items at Elementality, so look out for that! We will also be getting started on a project for cello player, Ben Sollee. They are making an effort to make all of his merchandise available at shows more sustainable and artful. As part of this “merch that matters” project, the Factory has been hired to make rosin bags out of recycled material! Hand crafted rosin will also be made, as well as some other great stuff like bike bells. It’s been real inspiring to work with these people who are changing the music industry. They often do full tours on bike, and unite with biking initiatives local to the towns where they play. 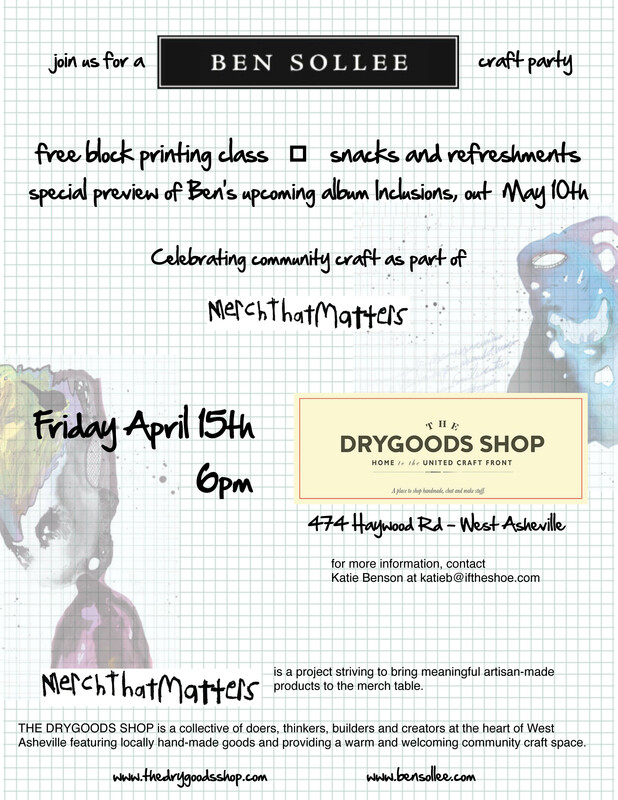 At the end of this week they have organized a community event at the Dry Goods Shop in West Asheville to create more art for their tour coming up in May. Rhetorical Factory is a Vessel.